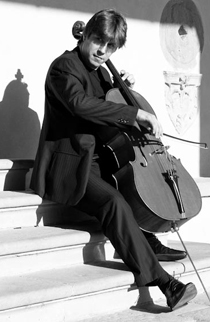 Thomas Carroll, cello, was born in Swansea, Wales, and studied with Melissa Phelps at the Yehudi Menuhin School and with Heinrich Schiff in Austria. An exceptionally gifted cellist, he is one of only two artists who auditioned successfully for both the Young Concert Artists Trust in London and Young Concert Artists, Inc. in New York. He has since gone on to give critically acclaimed debut recitals at Wigmore Hall (London), Alice Tully Hall (NY) and in Boston, California, Florida and Washington DC. As a concerto soloist Carroll has appeared with various orchestras including the London Symphony Orchestra, the Philharmonia Orchestra, the Royal Scottish National Orchestra, the Vienna Chamber Orchestra (conducted by Heinrich Schiff), the English Chamber Orchestra, the Prague Philharmonic, the Sofia Philharmonic, and the Bayerischer Rundfunk Orchestra. Much in demand as a chamber musician, Thomas Carroll has worked with the Belcea Quartet, Chilingirian Quartet, Endellion Quartet, Yehudi Menuhin, Ivry Gitlis, Gidon Kremer, Steven Isserlis, Mischa Maisky, Michael Collins, Julian Rachlin at Wigmore Hall, the Edinburgh and Cheltenham International Festivals, among many others. His recordings include Michael Berkeley’s String Quintet with the Chilingirian Quartet for Chandos. Recent engagements include concerts at Wigmore Hall, the Louvre in Paris, Konzerthaus in Vienna, the Dubrovnik Festival, Bath MozartFest, Mecklenburg Festival and The International Chamber Music Festival in Utrecht with Janine Jansen, Julian Rachlin and Ensemble. Carroll has also given a series of concerts in Tokyo under the auspices of YCA Inc. and appeared as soloist with the BBC Concert Orchestra at the Queen Elizabeth Hall, Royal Philharmonic Orchestra, London Philharmonic Orchestra and Orchestre Regional de Cannes. In August 2007 he made his debut with the Melbourne Symphony Orchestra in a series of performances of Shostakovich’s Concerto No.2 and received an immediate re-invitation. Carroll returned as soloist with the Royal Philharmonic Orchestra, performed the Vivaldi Double Concerto with Heinrich Schiff and the Vienna Chamber Orchestra and gave recitals at the Cheltenham Festival and in many places all over Europe and in Japan. His and eminent pianist Llyr Williams’ CD of Beethoven, Schubert and Brahms sonatas was released in 2010 on the Orchid Label.